Abdominoplasty may have serious postoperative problems as well as prolonged healing after surgery. Therefore, new techniques are needed to improve results and to decrease complications. Tension suture technique combined with lidocaine-adrenaline-saline infiltration prior to surgery can be used to achieve this goal. 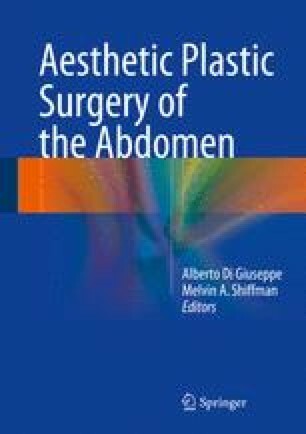 Tension sutures have been shown to decrease complications in abdominoplasty and lidocaine-adrenaline infiltration to reduce bleeding in other major operations. These two techniques are combined, and the results show that this technique is safe and reduces operating time, blood loss, and clinical complications as well as makes use of drains unnecessary with minimal risk of postoperative seroma formation. Also wound complications are rare. This chapter is based on our study and experience of more than 350 patients operated on using this technique.